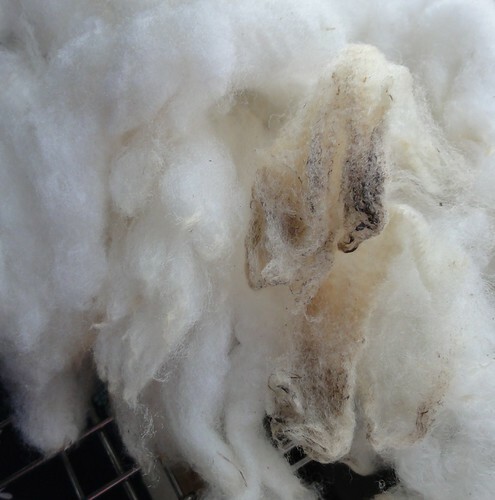 Here’s a quick look at the Rambouillet/Romney fleece (in the last post, it’s the one that took up the whole table) before and after washing. I used a two-hour hot soak with an enzyme-free dish soap, followed by another hot soak without soap and then a final rinse with a dash of vinegar and spin dry. I’m washing this fleece in small batches to preserve the lock integrity and so that I can do a really thorough job. Thus far the fleece is beautiful and I can’t wait to start combing and spinning. Have to wait for it to dry first, though!